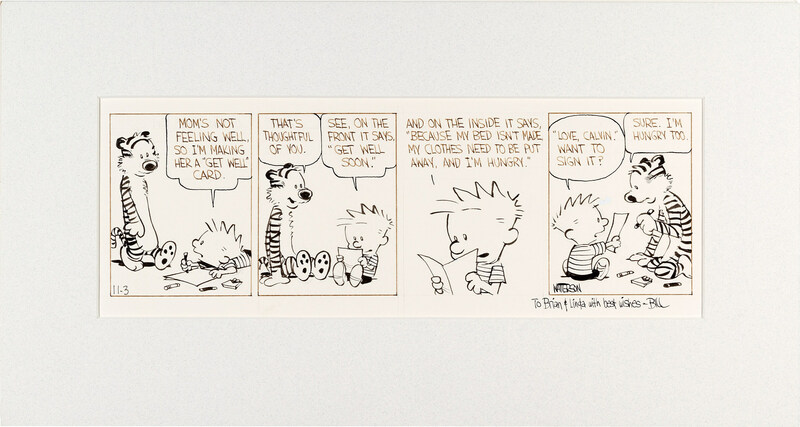 If you were bemoaning the lack of Calvin and Hobbes originals currently in the marketplace following the sale of the Sunday strip that went for more than $200,000 last November, we've got good news: Heritage Auctions has another original piece for sale. Now the bad news: You probably won't be able to afford this one either.The black and white daily strip that originally ran on November 3, 1986 is part of a set of original strips that C&H creator Bill Watterson swapped with Brian Basset, creator of Adam@Home and Red and Rover, that same year. Basset reportedly sold the color piece last November to relieve some financial trouble, but this latest piece is being put up by Linda, Basset's now ex-wife. Regardless, based on the price that the color piece brought, potential buyers should start saving their money now. As of press time, the auction has just reached $15,000. With a little more than two weeks left before the auction wraps on February 21, it seems likely that the winner will be somebody whose days pockets are just packed (with cash).